Have you ever swam out in the sea and not been able to see the bottom? All you can feel is the freezing cold water beneath your feet, all you see is dark blue water extending to infinity. 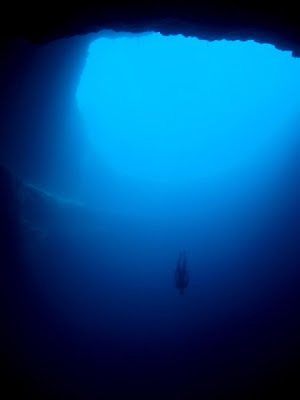 Imagine for one second descending into the blue, deeper and deeper with every kick and breath. The adrenaline kicks in and as the pressure builds, water compresses your chest - you’re scared, but there is something strangely inviting about the descent that makes it feel like you’re travelling to the center of the Earth. Looking ahead and all around you can see only a wall that drops for meters into the blackness below, and it is inviting, alluring. Welcome to the world of blue holes. First discovered by Jacques Cousteau, one of the world’s most famous divers and marine conservationists, the Great Blue Hole in Belize is the best of the bunch, and every diver’s dream. 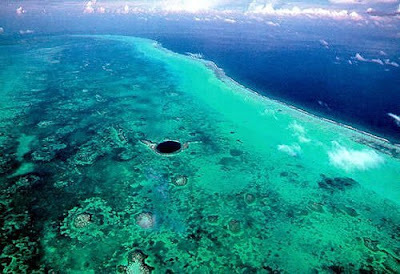 Measuring 305m (1,000 ft) across and 123 m (400 ft) deep, the Blue Hole is almost perfectly circular and can be found in Lighthouse Reef Atoll, about 60 miles from Belize City. The Great Blue Hole in Belize is a Mecca for those wanting to dive among its giant stalactites and stalagmites that were formed during the last Ice Age. Starting at around 30-33 meters, the limestone formations become more intricate with depth, but few get to see what they look like as most divers are only qualified to go to a depth of around 30 meters, although, when it comes to diving in blue holes, many flout the rules. Until only about 25 years ago, Dahab was a tiny Bedouin fishing village on the Sinai coast, about 50 miles from Sharm el-Sheikh to the south. Now it’s known worldwide for having great windsurfing conditions and some of the best shore diving anywhere. 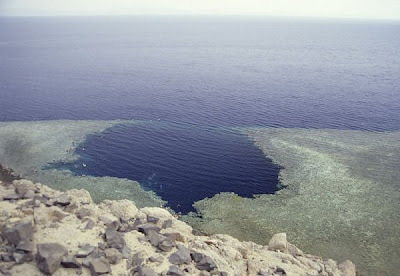 Only a short drive north of the main centre of Dahab is the notorious Blue Hole, known among diving circles as the ‘World’s Most Dangerous Dive Site’. 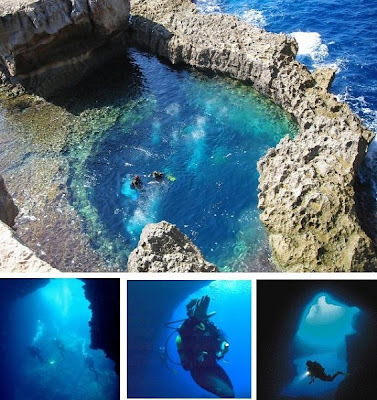 It can be accessed from the shore and is around 130m deep, but with a tunnel at 52 m many divers are tempted to go beyond the recreational diving limit of 40 m to experience everything the Egyptian blue hole has to offer, including nitrogen narcosis for the unfortunate few. 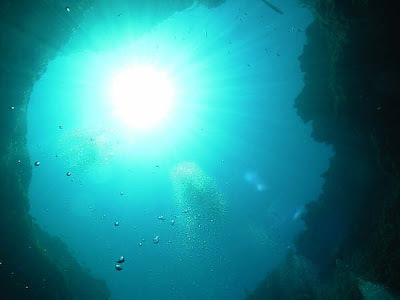 Because the entrance is hidden and difficult to spot, divers looking for a way in often go too low, increasing the risk of ‘the bends’ or nitrogen narcosis, some are never seen again. One of the deepest blue holes at 663ft deep, Dean’s is quite different from the previous two in that it widens to a 100 m cavern at about 20 m down. 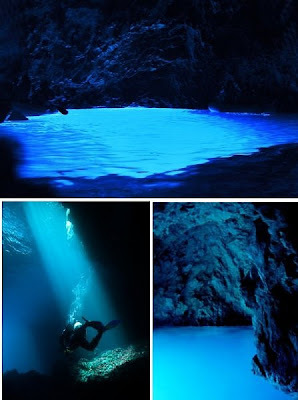 It is named after the family who own the land nearby and is another popular dive spot. The Vertical Blue 2008 free-diving competition was held here in April, when 25 national records and 5 world records were broken, and just the year before free-diver William Trubridge from New Zealand shattered the free-diving world record reaching lung-squishing depth of 84m, without the use of fins. 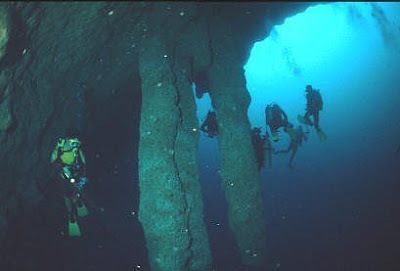 Located within the blue hole is a cave at 15 m below where shoals of tuna, groupers and barracuda are often found hovering by the large boulders and rocks. Divers can swim through a short tunnel, or chimney, to get to a different area within the hole which has great coral gardens and reefs teeming with marine life, which is quite amazing considering how fished out many parts of the Mediterranean are. 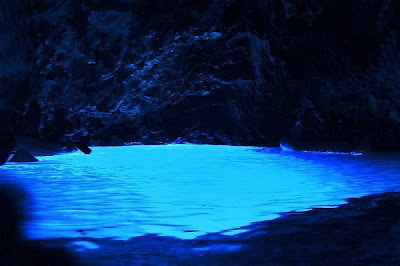 Just off the coast of Korcula, one of Croatia’s biggest islands you’ll find Modra Spilja (the Blue Cave). 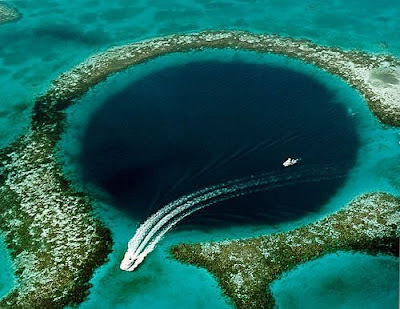 Accessible only by boat, the blue hole is entered at 9 m below the surface of the waves and reaches a depth of 35 m, a baby compared to some other blue holes. But this means it is more easily lit up buy the sun’s rays, making visibility easier and the dive all the more pleasant. Marine life, sponges and corals line the walls, along with giant red and yellow gorgonias, or sea fans, making it one of Croatia’s top dive spots. 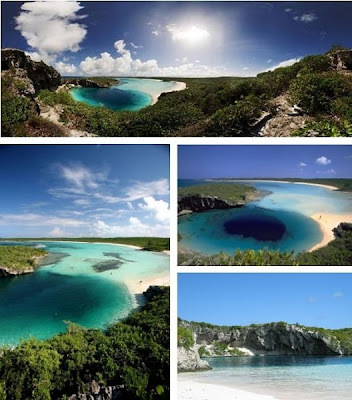 Where’s your favourite blue hole?